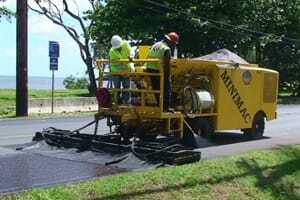 Valley Slurry Seal continues to pioneer pavement maintenance equipment solutions by introducing the VSS Minimac CR-1000, the world’s only compact slurry seal/micro surfacing machine with continuous run operation. Now contractors can have all the great features and benefits of the go-anywhere, highly respected Minimac® and take on larger jobs where continuous-run paving is an advantage or a requirement. Operating in confined spaces, in a non-continuous mode, for parking lots, garages, driveways, footpaths, walkways, golf cart paths and other jobs where big machines and large crews aren’t feasible or cost effective. The Minimac CR-1000 is even more versatile since it can be driven from either end of the machine thanks to it’s dual-drive system. This allows the driver to be located in the most optimum position for either continuous-run operation in the front or in the back for traditional slurry seal/micro surfacing. 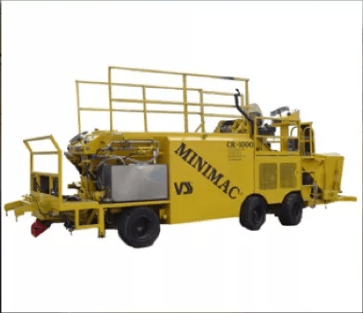 The Minimac CR-1000 offers production rates of 1.5 tonnes/min. (1.65 tons/min.) or better. to 15%. With a proper material staging, non-continuous operation loading takes as little as five minutes.